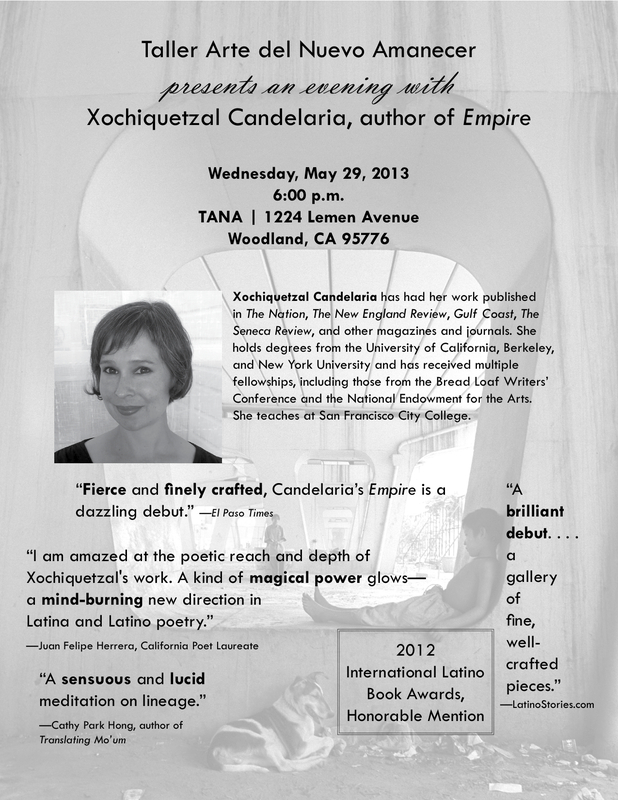 Taller Arte del Nuevo Amanecer would like to invite you to a special evening with poet Xochiquetzal Candelaria, this upcoming Wednesday, May 29 at 6 p.m. She will read from her book Empire, published by University of Arizona Press as part of its prestigious Camino del Sol series. Xochiquetzal Candelaria holds degrees from the University of California, Berkeley and New York University, and is currently a faculty member at San Francisco City College. She has received multiple fellowships, including an individual literature fellowship from the National Endowment for the Arts in 2009. This year, Latino Stories named Candelaria one of the “Top Ten New Latino Writers to Watch.” Her work has been published in The Nation, The New England Review, Gulf Coast, Seneca Review and other magazines and journals. For more information about her poetry you can click here.